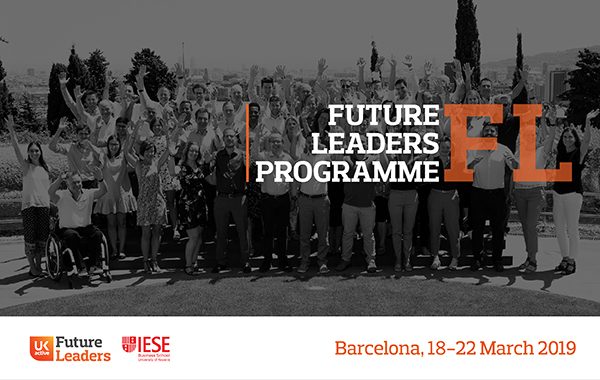 Future Leaders includes a number of interactive, dynamic learning methods like Case Discussions, prepared by IESE Business School through a case study for each day of the programme. Drafting an Executive Challenge is another key method of the programme to gain valuable insight and feedback about how to address and develop a specific area of the company’s business plan. Moreover, participants will also have to provide a 100 day plan at the end of the programme to ensure that the valuable lessons are put into practice on return to the workplace. to the programme. Discussions, presentations and small- group learning activities. Networking acquires an important role in the programme too as several events will take place outside the classroom to enhance the academic content, including a tour of Barcelona, sports and team building activities, and networking dinners with colleagues and faculty members. “Development of our team at all levels is of paramount importance and the UKActive Future Leader Programme is an integral component of our Senior Team development journey”, says Derek Crawford, Group Operations and People Director, Fitness First. Former participants like Phillippa Werbinski, People Director, Virgin Active, feels “lucky to have gained a place on the Future Leaders Programme a few years ago. I can’t recommend this learning opportunity enough. If you work in the Leisure and Fitness industry, and are looking to boost your career by taking your next career step into senior leadership talk to UKActive about 2019 cohort”, recommends Mss Werbinski. If you want to submit your application, visit http://ukactivefutureleaders.com/application/ and http://ukactivefutureleaders.com/ for further information.